Solar cells are among the most promising technologies for renewable clean energy. April 12, 2019, Graduate Student Michael Worku won the 1st prize of the Jim Brooks Graduate Student Award. Congratulations! March 6, 2019, Graduate Student Chenkun Zhou has been selected to receive one of the 2019 Graduate Student Research and Creativity Awards. Congratulations! January, 2019, Our work “Bulk Assembly of Corrugated 1D Metal Halides with Broadband Yellow Emission” has been published in Advanced Optical Materials. December 20, 2018, Our invited review article “Low dimensional metal halide perovskites and hybrids” has been published in Materials Science and Engineering: R: Reports. November 7, 2018, First year graduate stduent Azza Akacha joined the group. Azza obatined B.S. of Chemistry and M.S. of Solid-State Chemistry at the Faculty of Science of Tunis in 2016 and 2018. October 10, 2018, Three new members joined the group, Dr. Qingquan He (Ph.D. in Chemistry, Shanghai Jiao Tong University) and Dr. Liangjin Xu (Ph.D. in Chemistry, Chinese Academy of Sciences) as postdoctoral fellows, and Heng Zhang (M.S., Taiyuan University of Technology) as an visiting student. September 19, 2018, our work “Blue Emitting Single Crystalline Assembly of Metal Halide Clusters” has been published in JACS. Augst 28, 2018, our work “Sunlike White-Light-Emitting Diodes Based on Zero-Dimensional Organic Metal Halide Hybrids” has been published in ACS Applied Materials and Interfaces. July 24, 2018, our invited overview “Organic–inorganic metal halide hybrids beyond perovskites” has been published in Materials Research Letters. May 23, 2018, our collaborative work with Prof. Angang Dong at Fudan University and Dr. Mao-Hua Du at ORNL “A One-Dimensional Organic Lead Chloride Hybrid with Excitation-Dependent Broadband Emissions” has been published in ACS Energy Letters. May 7, 2018, Ella Berkwits and William Fowler joined our group as undergraduate research assistants. April 20, 2018, Yu Tian, first graduate student of the group at FSU, defended his doctoral desseration. April 11, 2018, our collaborative work with Dr. Yingzhong Ma at ORNL “Direct Evidence of Exciton–Exciton Annihilation in Single-Crystalline Organic Metal Halide Nanotube Assemblies” has been published in the Journal of Physical Chemistry Letters. April 1, 2018, our work “Highly Efficient Spectrally Stable Red Perovskite Light Emitting Diodes” has been published in Advanced Materials. Mar 12, 2018, our work “Facile Preparation of Light Emitting Organic Metal Halide Crystals with Near-Unity Quantum Efficiency” has been published in Chemistry of Materials. Jan 19, 2018, our work “Luminescent Zero-Dimensional Organic Metal Halide Hybrids with Near-Unity Quantum Efficiency” has been selected as cover story of Chemical Science, Issue 3, 2018. December 15, 2017, Sujin Lee joined the group as a Ph.D. student from the Department of Chemical and Biomedical Engineering. Sujin received her B.S. in Chemistry from Sungshin Women’s University and M.S. in Chemical Engineering from Kyung Hee University. December 07, 2017, our work “A Zero-Dimensional Organic Seesaw-Shaped Tin Bromide with Highly Efficient Strongly Stokes-Shifted Deep-Red Emission” has been published in Angewandte Chemie International Edition. December 05, 2017, our work “A Highly Efficient Broadband Yellow Phosphor Based on Zero-Dimensional Tin Mixed-Halide Perovskite” has been published in ACS Applied Materials & Interfaces. November 29, 2017, our Perspective “Low-Dimensional Organometal Halide Perovskites” has been published in ACS Energy Letters, which has also been selected as an ACS Editors' Choice paper. November 21, 2017, our work “Luminescent Zero-Dimensional Organic Metal Halide Hybrids with Near-Unity Quantum Efficiency” has been published in Chemical Science. November 1 2017, Maya Chaaban joined the group as a Ph.D. student from the Department of Chemistry and Biochemistry. Maya received her B.S. in Chemistry from Lebanese University, M.S. in Industrial Chemical Analysis from Lebanese University, and the second M.S. in Inorganic Chemistry from American University of Beirut. October 30, 2017, our work “Manganese-Doped One-Dimensional Organic Lead Bromide Perovskites with Bright White Emissions” has been accepted for publication in ACS Applied Materials and Interfaces. July 06, 2017, our work “Low-Dimensional Organic Tin Bromide Perovskites and Their Photoinduced Structural Transformation” has been published in Angewandte Chemie International Edition. FSU has a news story about our work, which has also been mentioned in a number medias, including Phys.org, Follownews, etc. June 26, 2017, Prof. Biwu Ma has been awarded another three year NSF grant entitled "Low Dimensional Organometal Halide Perovskites" for a total of $428,650. June 13, 2017, Prof. Biwu Ma has been awarded a three year NSF grant entitled "Multi-Excited-State Phosphorescent Molecules With Photoinduced Structural Changes" for a total of $363,682. January 30, 2017, Dr. Haoran Lin joined the group as a Postdoc Research Fellow. Dr. Lin received B.S. from Peking University in 2012 and Ph.D. from the Hong Kong University of Science and Technology in 2017. January 12, 2017, our paper with Dr. Haibo Zeng's group "Two-Dimensional Metal Halide Perovskites: Theory, Synthesis, and Optoelectronics" has been published in Small Methods. January 04, 2017, our work "One-dimensional organic lead halide perovskites with efficient bluish white-light emission" has been published in Nature Communications. FSU has a news story about our work, which has also been mentioned in a number medias, including Phys.org, EurekAlert, etc. .
September 26, 2016, our work "A Microscale Perovskite as Single Component Broadband Phosphor for Downconversion White-Light-Emitting Devices" has been published in Advanced Optical Materials. August 08, 2016, our work "Phosphorescent Molecular Butterflies with Controlled Potential-Energy Surfaces and Their Application as Luminescent Viscosity Sensor" has been published in Inorganic Chemistry. June 22, 2016, our work "Thermal Imprint Introduced Crystallization of A Solution Processed Subphthalocyanine Thin Film" has been published in Advanced Materials Interfaces. June 10, 2016, our work "A Solution Processed Organometal Halide Perovskite Hole Transport Layer for Efficient Organic Light Emitting Diodes" has been published in Advanced Electronic Materials. The results are highlighted in Materials Views China. March 03, 2016, our work regarding luminescent nanoscale Quasi-2D perovskites in Chemical Communications is selected as one of the covers of Issue 20, 2016. February 02, 2016, our work "Highly Luminescent Nanoscale Quasi-2D Layered Lead Bromide Perovskites with Tunable Emissions" has been accepted for publication in Chemical Communications. Congratulations to Zhao Yuan and Yu Shu. November 24,2015, WCTV has highlighted our perovskite LED work (with Dr. Hanwei Gao’s group) in their news report "FSU Researchers Develop 'New Generation' LED". 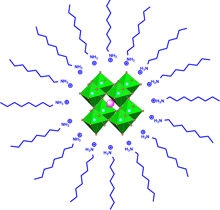 November 19,2015, Our work with Dr. Hanwei Gao’s group “Bright light-emitting diodes based on organometal halide perovskite nanoplatelets” has been published in Advanced Materials. FSU has a news story about our work on the university front page, which has also been mentioned in a number of medias, including ScienceDaily, Phys.org, etc. September 30, 2015, Nicholas K. Doyle and Joshua R. Messier joined our group, welcome! 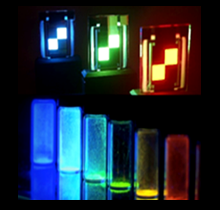 September 15, 2015, our work "Facile One-Pot Synthesis of Deep Blue Luminescent Lead Bromide Perovskite Microdisks" has been accepted for publication in Chemical Communications. August 03, 2015, ChemistryWorld has highlighted our work in a report "Phosphorescent 'butterfly' molecules' glow tuned". July 23, 2015, our work “Precise Design of Phosphorescent Molecular Butterflies with tunable Photoinduced Structural Change and Dual Emission” has been published in Angewandte Chemie International Edition. The work is also highlighted on the journal’s front cover. FSU has a news story about our work on the university front page, which has also been mentioned in a number of medias, including Nanowerk, ScienceDaily, ASM International, AZO Materials, etc. July 15, 2015, Yuan Lin defended her M.S. thesis entitled “Phosphorescent Molecules with Photoinduced Structural Change for Temperature and Viscosity Sensing”. Congratulations to Yuan Lin, the first student graduated with M.S. degree in our group at FSU. 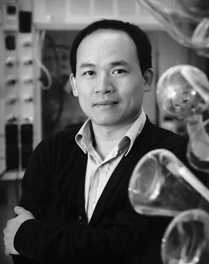 March 22, 2015, Dr. Biwu Ma gave an invited talk in the session of ACS Award in the Chemistry of Materials: Symposium in Honor of Mark E. Thompson. March 1, 2015, Dr. Zhao Yuan joined the group, welcome! 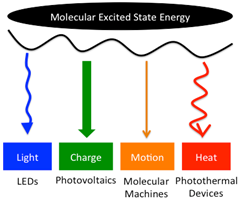 September 2014, Dr. Biwu Ma gave a seminar talk, Photoactive Molecules for Solar Energy Conversion, at the Department of Mechanical Engineering at FAMU-FSU College of Engineering. August 2014, our paper on phosphorescent molecular butterfly has been published in Angewandte Chemie International Edition. FSU has a news story about our work on the university front page, which has also been highlighted in a number of medias. August 2014, three graduate students, Yuan Lin, Yu Shu and Chenkun Zhou, joined the group. 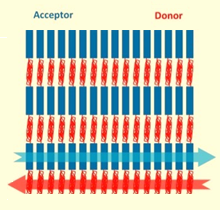 August 2014, Dr. Biwu Ma gave a presentation, Molecular Butterfly with Two Excited States for Phase Transfer Sensing and White Emission, at 248th ACS National Meeting & Exposition, San Francisco.